Home MTAANI NEWS Save us this balderdash about independent candidates, Wainaina tells Jubilee candidates. Save us this balderdash about independent candidates, Wainaina tells Jubilee candidates. Eng. Patrick Wainaina Wa Jungle addressing the residents of Gichiiki Village in Maguguni Ward where he asked them to vote for him as he was the best placed person to help them work out solutions to their challenges. Eng. Patrick Wainaina Wa Jungle has described the kind of animosity meted against independent candidates by Jubilee Party candidates as the ‘famous sibling pernicious rivalry’ to find their niche within the family. 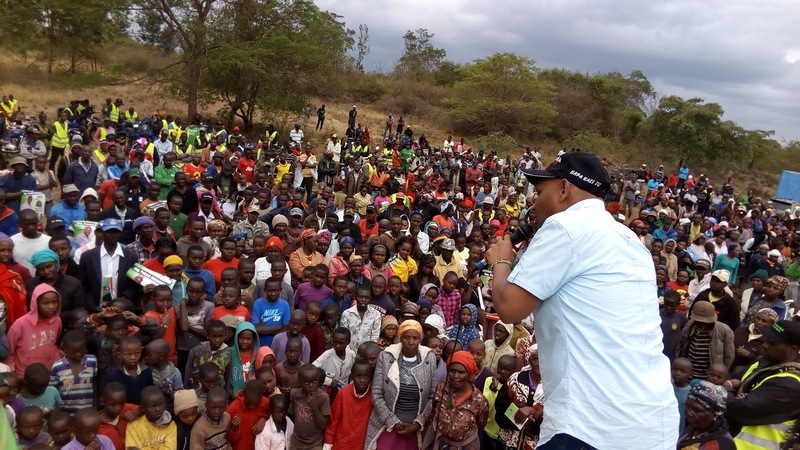 Speaking at various stops during his campaigns for the Thika Town Constituency on Thursday, Wainaina reaffirmed that independent candidates within the Mt. Kenya region, just like their counterparts vying in other Jubilee friendly parties, were strongly behind President Uhuru Kenyatta and his deputy William Ruto and would always support government programmes, policies and motions, both in and outside the precincts of Parliament. He added that the JP candidates were behaving like the same way first born kids did immediately after the birth of the second child. “There’s always going to be a little bit of jealousy between siblings, which is a normal part of human nature. The JP candidates feel threatened now that they are no longer living within the comfort zones. They have become very violent whenever anyone mentions or even thinks of the independent candidates, especially after it has been revealed what they did during the nominations,” said Wainaina. He reminded them that President Uhuru Kenyatta was a father to many children who included the independents and that he would willingly treat his ‘children’ equally and level the playing field by protecting and supporting the children who weren’t in his party just like those in JP. Wainaina underscored the intelligence of the modern voter who would never be tossed right-left-and-centre by politicians saying that it was no longer business as usual for non-performers. He pointed out that the performance of both President Uhuru Kenyatta and his deputy William Ruto was very evident but their work was made so difficult by majority of their party MPs who only excelled in sideshows but had nothing to show for their tenure in office. “Wanjiku is tired of empty rhetoric and no services. She has outlived the era where everything said by political leaders counts. The wananchi know what they want and they will go to any length to get it. This time they have said a BIG NO to none performers as these are the same people who were dragging the Jubilee Party agenda in the current Parliament. Politicians now have to shape up or ship out. You just learn to live with it,” he asserted. He called on his opponent Hon. Alice Wambui Ng’ang’a to present her scorecard for the last 4½ years to the people of Thika Town Constituency instead of jamming the constituency will so many politicians just to fight him. “The people of Thika mandated her to work for them in 2013. What has she delivered with the Sh. 100 million given to her annually as CDF? Absolutely nothing! And that is the reason she bringing in everyone in Jubilee Party to assist her cover her mess. Every tree is judged by their fruits. Just accept that you have failed the people of Thika and let them decide who they want as their next MP,” said Wa Jungle. He said that he was confident of an overwhelming triumph and promised to serve the people of Thika and make the constituency a model for others to benchmark from.